The CR-4000 comes with 5 coin and 5 bill fixed compartments. 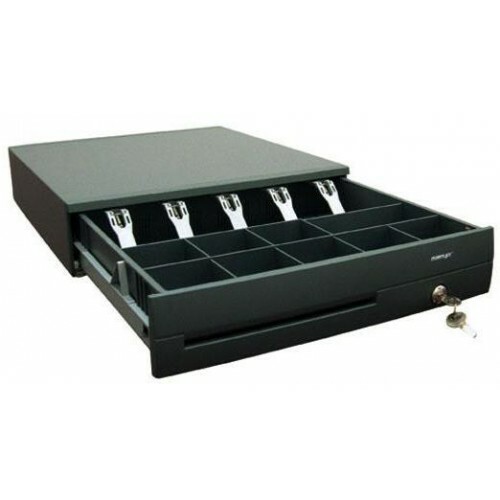 There is a coin roll storage compartment behind the bill compartments The CR-4000 has a ‘Screw less’ tamper resistant design and a special feature cushions drawer slams and protects the system. The chassis and drawer have durable metal construction with high reliability and durability (MTBF over 1 million open/close).In addition, an enhanced version of the CR4210C now includes An embedded powder coat anti-scratch finish, which will better protect the surface from normal wear and tear, often results in discolouring or permanent scratches, thereby extending the life of the drawer. Interfaces available are printer-driven, dedicated RS232, non-dedicated RS232, parallel, serial and USB. An all-in-one intelligent model meets all interface requirements.